Ranting Panda: What will you do when they come for the Socialists? What will you do when they come for the Socialists? There has been a global increase in fascist and authoritarian behaviour by main stream right-wing parties, such as the Republicans and Australia's Liberal Party. Considering it is only a few decades ago that the world saw the culmination of evil that arises when people think they are better than others, when they fear others. What will you do when the government comes for the Socialists? What will you do when the government comes for YOU? If current behaviour is any indication, then you are doing, and will continue to do, nothing! Those who do speak up for the marginalised, the discriminated against and the persecuted, are often labelled as Do-Gooders, as though this is an insult! Better to be a Do-Gooder than a Do-Nothing. The Do-Nothings gave us Hitler. Too much of an exaggeration? In the US, the Republicans have presented a bill that can jail anti-fascist protesters for 15 years(1). They are seriously considering a Bill that targets people who protest against fascism, authoritarianism and Nazis. Meanwhile, President Trump described the Ku Klux Klan and Nazis as 'very fine people'(2). The government has already come for the refugees. We have seen that with Australia's indefinite imprisonment of asylum seekers and refugees, which has been condemned by the United Nations, Amnesty International and other humanitarian groups. Do-Gooders spoke up, Do-Nothings wallowed in the fear-mongering and lies that the government used when they labelled them terrorists and illegals, when they dehumanised them as willing to throw their children over-board (which was found by a Senate inquiry to have been a lie). The government has already come for the migrants. We've seen this with Trump separating children from families of migrants who have tried to cross into the US. He has continued to deport migrants who have lived in the country for years. Australia is also deporting migrants to countries that many left when they were babies. Do-Gooders spoke up, Do-Nothings wallowed in the fear-mongering and hate-speech that characterises immigrants as criminals, rapists, pedophiles and a drain on society. The government has already come for Muslims. Trump has recently banned travel from some Muslim-majority countries. Demonisation of asylum seekers, usually portrays them as being Islamic terrorists, even though these are people fleeing terror. Globally, there has been a push to ban Islam because of the characterisation that all Muslims are terrorists, even though very few are (and of course, Christianity itself has been far more violent, for instance it was Christians who were responsible for most of the wars of the 20th century). Then there are those who are persist with the attacks on Muslims by trying to ban the hijab and ban halal food. It hasn't quite gotten to the point of locking people up simply for being Muslim, but the rise in hate-crimes against them does indicate a frightening future if these attacks and hate-speech against Muslims continue. The government is attacking socialists, unionists and the left-wing broadly. In Australia, the debate about the anti-bullying program, 'Safe Schools', was labelled by a number of right-wing politicians as being a 'Marxist agenda of cultural relativism'(4). The Liberal Party demanded a royal commission into union corruption, which of course revealed very little, other than the fact that the government is trying to ban unions. Meanwhile, the right-wing cheered this on. Marxism has been used as a scapegoat every time the Liberal Party wages an attack on basic human or civil rights, such as marriage equality, treatment of asylum seekers, and even requests for wage rises and penalty rates. Many years ago, we fought a war against Nazis. We won. For decades it was a shameful thing to associate with Nazism. Now, it is not only accepted, it is something that some people are proud of. For instance, One Nation leader, Pauline Hanson, has proudly endorsed a neo-Nazi as the One Nation candidate in an upcoming federal by-election(5). There has been a rise in hate crime across the globe. Yet, calling it out is labelled as 'political correctness gone mad', with the right-wing claiming their freedom of speech is being constrained... simply because other people (often called Do-Gooders or cultural Marxists) ask them to show respect for people who are of a different colour, religion or nation. Hate crime in the United States has risen for four years straight(6), including increases in attacks on Muslims(7). There has been a significant increase in hate crimes against South Asians, Arabs, Muslims and Hindus(8). Irish columnist, Fintan O'Toole speculates that this shift to the extreme right-wing by formerly moderate parties is a trial run for fascism(9). Governments across the globe are pushing ever more extremist policies and seeing how well they are accepted. With the exception of those 'Do-Gooders', often times the policies are introduced with ne'er a word of protest from the Do-Nothings who justify these policies in the name of 'border security', biblical teaching or other reasons designed to explain away the fear-mongering and racism behind them. Hitler's final solution did not happen over night. It took many years for Hitler to arrive at the idea of gassing those he had imprisoned. While the world often remembers the six million Jews that were the victims of the Nazi regime, there were also another five million who included people from various groups, such as socialists, unionists, gypsies, the unwell, the gay, and dissidents. Germany's failure to challenge Hitler's racist and bigoted policies are what empowered him, and are what led to the holocaust. So, right-wing voter ... you may hate socialism, but when they come for the Socialists, what will you do? What will you do when they come for those you don't like? Will you be a Do-Gooder and speak up or a Do-Nothing and shut-up? Will you fight fascism or will you empower it? Better to speak up now, then to wait until there is no-one to speak up. 1. Huffpost, Zach Carter, GOP Anti-Antifa Act Could Send Masked Demonstrators To Prison For 15 Years. https://www.huffingtonpost.com.au/entry/house-republicans-unmasking-antifa-act_us_5b4527b1e4b0c523e263c2d5. Accessed 13 July 2018. 2. The Atlantic, Rosie Gray, 15 August 2017, Trump Defends White-Nationalist Protesters: 'Some Very Fine People on Both Sides'. https://www.theatlantic.com/politics/archive/2017/08/trump-defends-white-nationalist-protesters-some-very-fine-people-on-both-sides/537012/. Accesssed 13 July 2018. 3. 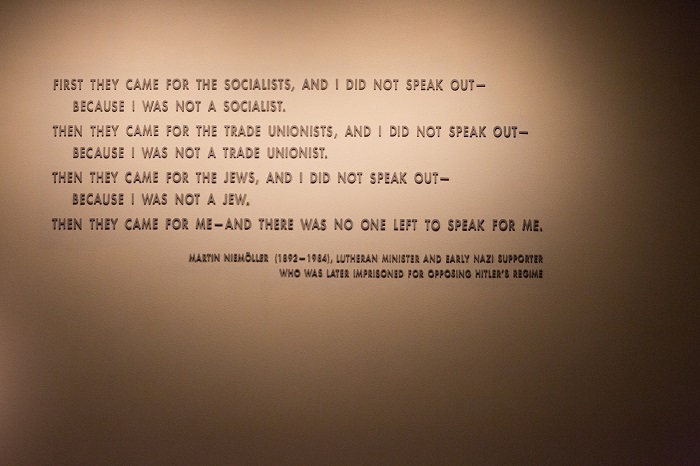 United States Holocaust Memorial Museum, MARTIN NIEMÖLLER: "FIRST THEY CAME FOR THE SOCIALISTS...". https://www.ushmm.org/wlc/en/article.php?ModuleId=10007392. Accessed 13 July 2018. 4. ABC News, Michael Bradley, The problem with evoking Marxism in the Safe Schools debate. http://www.abc.net.au/news/2016-03-24/bradley-marxism-and-safe-schools/7272764. Accessed 13 July 2018. 5. The New Daily, Jackson Stiles, One Nation preferences neo-Nazi over Labor in Longman. https://thenewdaily.com.au/news/national/2018/07/11/one-nation-preferences-longman/. Accessed 13 July 2018. 6. The Conversation, Brian Leven, James J. Nolan, John David Reitzel, 26 June 2018, New data shows US hate crimes continued to rise in 2017. https://theconversation.com/new-data-shows-us-hate-crimes-continued-to-rise-in-2017-97989. Accessed 13 July 2018. 7. DW, Reuters, Anti-Muslim hate crime on the rise in Donald Trump's US - report. https://www.dw.com/en/anti-muslim-hate-crime-on-the-rise-in-donald-trumps-us-report/a-43500942. Accessed 13 July 2018. 8. SBS, Vivek Asri, 16 November 2017, Hate crime against South Asians on a rise. https://www.sbs.com.au/yourlanguage/hindi/en/article/2017/11/16/hate-crime-against-south-asians-rise. Accessed 13 July 2018. 9. The Irish Times, Fintan O'Toole, 26 June 2018, Trial runs for fascism are in full flow. https://www.irishtimes.com/opinion/fintan-o-toole-trial-runs-for-fascism-are-in-full-flow-1.3543375. Accessed 13 July 2018.